Top boffins in the States believe they have unmasked the mystery attacker responsible for repeatedly wiping out towns in the Rocky Mountains and Great Plains, slaughtering thousands of inhabitants. The massacres are apparently being carried out by a type of carnivorous mouse, described by scientists as "nasty little beasties". There's no need however for our Midwestern readers to jump in their pickup trucks and flee their homes, or alternatively lock and load their fearsome arsenals of personal firearms preparatory to settling matters with the furry terrorists once and for all. The towns being depopulated, for now at least, are underground ones inhabited solely by prairie dogs. Prairie dogs, it should be noted for our non-Midwestern readers, are actually a type of squirrel which prefer to live in interlinked subterranean burrow "towns" which can underlie as much as 500 acres and hold as many as 5,000 residents. Puzzlingly, boffins including James Holland Jones of Stanford uni have been finding that these towns are regularly wiped out by dog-plague outbreaks. New prairie dogs then arrive and repopulate the town, but after a while the plague comes back and kills them all again. This is puzzling to prairie-dog boffins on two counts. First, it was unknown how the plague pathogens could survive between outbreaks. Secondly, prairie dogs are a bit like teenage gang members - they almost never move about within their towns, instead staying within a small territory or neighbourhood belonging to their own "coterie". This should mean that plague cannot spread through a town. "Previous studies have suggested some sort of magical reservoir for the plague pathogen," says Jones. "Maybe it gets into the soil and infects the re-colonized prairie dog town. Or perhaps it's carried in by some carnivore. Who knows?" Well, Jones and his colleagues do, seemingly. They say that the deadly scourge of the prairie dog is in fact the "grasshopper mouse", a type of carnivorous rodent which also lives in the dog-squirrels' subterranean mean streets. 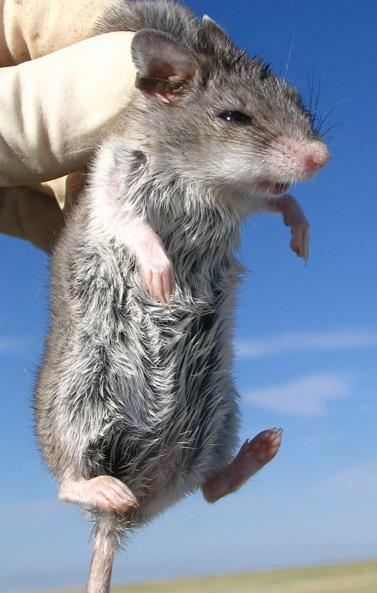 "Grasshopper mice have no respect for prairie dog territories," Jones says. "They're nasty little beasties, and when they eat the carcass of a prairie dog that's died of plague, the fleas climb aboard the mice. The mice then schlep the fleas around to different territories, connecting family groups that otherwise wouldn't be in contact." Nonetheless it seems that the idea of prairie dogs being wiped out in a fearsome campaign on of carno-murine bioweapon genocide has caused a heated debate in the world of subterranean dog-squirrel boffinry. "A number of people familiar with prairie dogs say there is no way that the grasshopper mouse is causing this, because they only trap a few mice a year," Jones says. "So we decided to write a computer model to determine if the number of mice being trapped is consistent with driving these plague epizootics." Lo and behold, the computer model did in fact finger the carnivorous mice as the mystery dogsquirrel-slayer annihilation factor. "Plague sort of smolders in the prairie dog community for long periods in between epizootics," according to Jones. "The mouse is like the spark that allows the pathogen to get carried to a new place where there's more fuel. And then just the right set of events coalesces, where you have the right mouse densities and the right spatial pattern of infected prairie dogs. At that point, the mice trigger the epizootic, and suddenly you get this catastrophic mortality."